wpsantennas.com is a SureCall Cellphone-Mate Master Dealer/Distributor. We are a Stocking Dealer so rest assured that your order will ship from our Rochester Minnesota location*. Orders received by 2 PM Central time ship the same day. In the event you have an emergency situation please contact us for shipping options beyond what is listed on our ecommerce website as we have the ability to ship beyond our closing time for Hot orders. Our central U.S.A. location in Rochester Minnesota gives us a shipping advantage as ground package service from UPS covers a majority of the country with 2-3 day service. We also offer LTE freight shipping on larger orders and gladly accept our customers' shipping account numbers for bill to receiver and third party billing if necessary. Cellphone-Mate's line of SureCall Amplifiers and Repeaters are made in China with the design and distribution here in the USA. 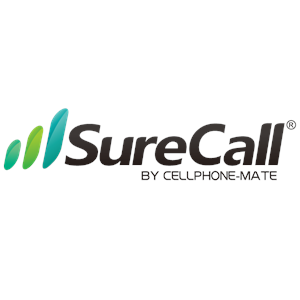 SureCall cellular boosters overcome the problem of dropped calls, limited range and reduced data rates for cell phones and data cards by amplifying weak cellular signals. SureCall's powerful bidirectional cellular amplifiers provide the highest receiver sensitivity in the industry and protect cell sites by preventing oscillation and overload. SureCall also produces efficient cellular antennas in a wide range of designs (omni, Yagi, panel) for interior and exterior mounting in buildings, cars, trucks, RVs and boats. SureCall cellular improvement products are available as plug-and-play kits, or you can custom configure your own cellular repeater for your unique application by choosing specific SureCall cellular amplifiers, cellular antennas and cellular accessories from wpsantennas.com. To connect a SureCall Cell Phone Antenna to your phone you will need the appropriate phone adapter cable. To connect a SureCall Cell Phone Antenna to a hands free car kit you may need either a FME/Male to MiniUHF/Male adapter or FME/Male to TNC/Male adapter. Adding an Inline Cellular Booster/Amplifier to your Cellular Antenna/Adapter purchase increases the strength of the incoming signal and boosts your output power up to a maximum of 3 Watts. **In rare occasions due to quantity or supply issues your order may ship from a different location. Cellphone-mate inline amplifiers, vehicle amplifiers, vehicle repeaters and home or office wireless repeaters. Cellphone-Mate Omni-directional dual band exterior and interior antennas. Cellphone-Mate Dual Band high gain directional antennas. Omni-directional dual band vehicle antennas. Cables and Connectors, Splitters and Couplers, and Power Supplies for SureCall Antennas, Amplifiers and Repeaters. The innovation leader in cellular amplifier technology , Cellphone-Mate® specializes in the design and manufacture of cell phone signal boosters, amplifiers and accessories. These boosters and amplifiers dramatically improve cellular communication for businesses, homes and mobile settings. Our SureCall® flagship product line of FCC-approved cellular amplifiers boosts the range and reception of almost any cellular transmission, including voice or data. Founded in 2001 and based in the Silicon Valley, Cellphone-Mate is an industry leader with multiple patents pending on our superior signal amplifier technology. Fortune 100 and 500 companies, such as Chrysler, Hewlett-Packard, Exxon Mobile, and Newell-Rubbermaid, trust and use Cellphone-Mate products, as does the U.S. Military and State Department, as well as top universities such as Stanford and Duke. We continue to develop innovative new products that address the changing needs of all types of cellular and mobile broadband users. First-to-market in designing 4G boosters for every major U.S. carrier and the standard-setting Force-5, the first self-contained 5-band amplifier on the market, Cellphone-Mate is committed to continually developing new products that address the changing needs of all types of cellular and mobile broadband users. All products are covered by an industry exclusive two-year warranty and a 30-day money-back guarantee.